The average full-time pay gap between men and women is at its narrowest since comparative records began in 1997, official figures show. The difference stood at 9.4% in April compared with 10% a year earlier, the Office for National Statistics (ONS) said, a gap of about £100 a week. However, the change was the result of men's wages dropping faster than women's in real terms. Allowing for inflation, weekly earnings for all fell by 1.6% compared to 2013. Before taking inflation into account, the £1 rise in full-time median gross pay for men and women to £518 a week was the slowest rise since records began in this form in 1997. The 9.4% gender pay gap compares with the gap of 17.4% that was recorded in 1997. Hourly earnings figures reveal that, in April 2014, women working for more than 30 hours a week were actually paid 1.1% more than men in the 22 to 29 age bracket and, for the first time were also paid more in the 30 to 39 age bracket. Although weekly earnings suggest men are paid more in all age groups, the hourly earnings level is the preferred measure used by the ONS to judge the pay gap. Chancellor George Osborne said the figures were "another sign of progress in the fight for equal pay". The gender pay gap for all employees, full-time and part-time, was also the lowest on record at 19.1%, down from 19.8% in 2013. The TUC said the gap could be cut further with better paid, flexible, part-time work opportunities, and better paid leave for fathers to encourage more equal parenting. The government said that, from next year, it was extending the rights for shared parental leave. It had also invested in training and mentoring for women to move into higher skilled, higher paid jobs, and guidance to women looking to compare their salaries with male counterparts. The ONS figures also showed that the growth in wages was the slowest since records began in 1997. Full-time median gross pay totalled £518 a week in April, up 0.1% - or £1 - on a year earlier. That is the equivalent of nearly £27,000 a year. The median average is the mid-point of all wages top to bottom. The figures reflect the squeeze faced by workers who have seen wages rise, but prices rising faster. When the rising cost of living is taken into account, real earnings fell over the same period. Those who are unable to secure full-time, continuous employment have been at the sharp end of this situation. Wages for the 70% of people who have been continuously in their job for more than a year have gone up by 4.1% in the past year - more than three times the rate of inflation. However, those in more sporadic employment - generally lower skilled jobs - have pulled the average wage down. Frances O'Grady, general secretary of the TUC, said: "Ordinary households are not sharing in the recovery and the recession in their wages continues despite the economy's return to growth." 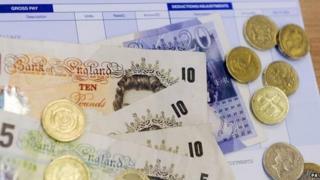 However, the ONS warns that comparing private and public sector wages can only reflect part of the picture. This is because the figures do not show differences in the rates of pay for the same type of job. For example, many of the lowest-paid occupations, such as bar and restaurant staff, hairdressers, and cashiers, are mainly private sector jobs, while there are a larger proportion of graduate-level and professional occupations in the public sector. At the highest level of pay, it is likely that private sector wages are higher than those in the public sector. Since 1997, the gap has been relatively consistent, the ONS said. Employers can pay someone below the minimum wage legitimately, for example by providing accommodation tied to the job, as is the case for many hotel workers. The survey is based on a sample of tax returns, so excludes self-employed workers. How much do people earn? The UK median wage is £22,044 for all workers, full-time and part-time. Men in full-time work earn on average £29,441 and women in full-time jobs earn £23,889. Where is pay the highest? Whitehaven in Cumbria comes out top, home to the Sellafield nuclear complex and a new marina. Employees there have a median salary of £37,910. It is followed by London where the median wage across all workers is £29,696. That is followed by Basingstoke (£27,760), Newbury (£27,287), and Reading and Bracknell (£27,430) - all in the Thames Valley area. Where in Scotland are median earnings the highest? The Shetland Islands, at an average of £24,752, just beats Aberdeen (£24,510) and Edinburgh (£24,738). Where are the lowest paid people working? Ludlow in Shropshire at £14,033. What do different jobs pay? Train drivers' full-time median pay was £47,956. For printers, it was £25,922. For taxation experts it was £44,641. Bank and post office clerks received £20,873. Solicitors were paid £41,178. Air traffic controllers received £78,874, computer programmers and software developers were paid £40,007 and nurses were paid £31,641.